September is the month to celebrate independence in Belize. And 2011 is a special year. Â It marks the 30th anniversary of Belize becoming an independent nation. There are two separate independence holidays this month. The first is on September 10th, the final day of the Battle at St. George's Caye. Â In this decisive battle, Belize's Baymen and their slaves fought off the invading Spanish ships. 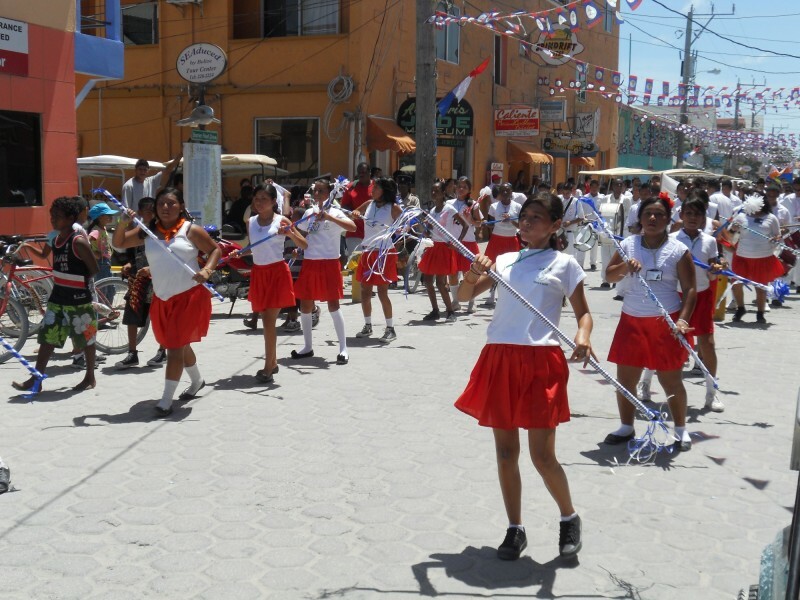 On September 10th we joined other San Pedranos, around the town square, to watch the independence day parade. On September 21st Belize will celebrate the day that British Honduras became the independent nation of Belize. But this year the entire month of September is a continuous celebration. Â A variety of events are being held, in honor of Belize's independence as a democratic nation. 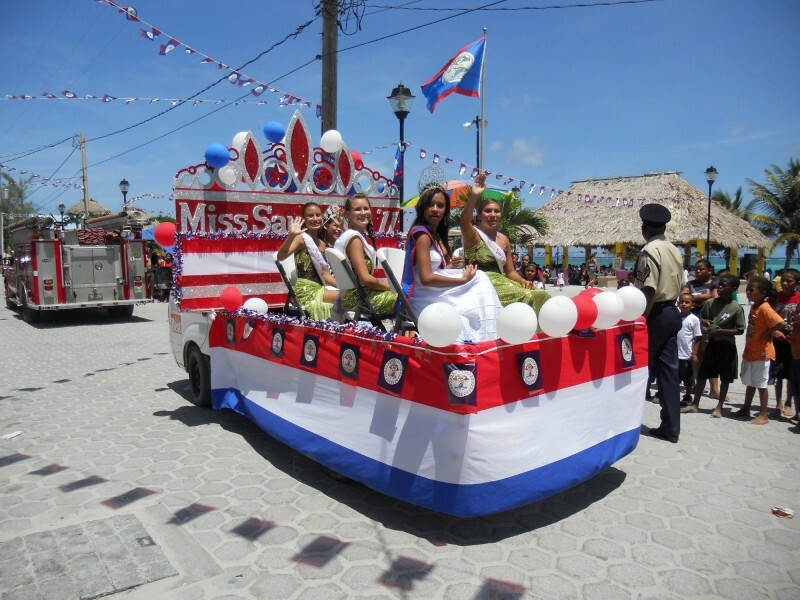 Here on Ambergris Caye, the first event was the Miss San Pedro beauty pageant. It was held on September 2nd, at the Saca Chispas Field. Then the new Miss San Pedro was sworn in during the September 10th festivities. 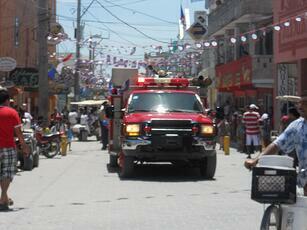 There is always a parade in San Pedro Town, to celebrate the significant victory of the Baymen at St. George's Caye. 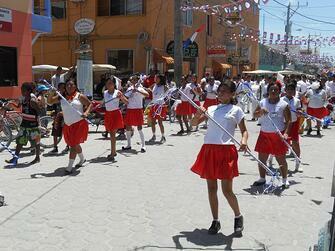 In addition to crowning the next Miss San Pedro, the local school children participate in the lively parade. Wearing their daily uniforms, the children march in the parade, to represent the local school they attend. This September,S an Pedro Town is adorned with Belizean flags. Â Note the streams of small flags draped across the main drag in town, shown in most of the pictures in this post. 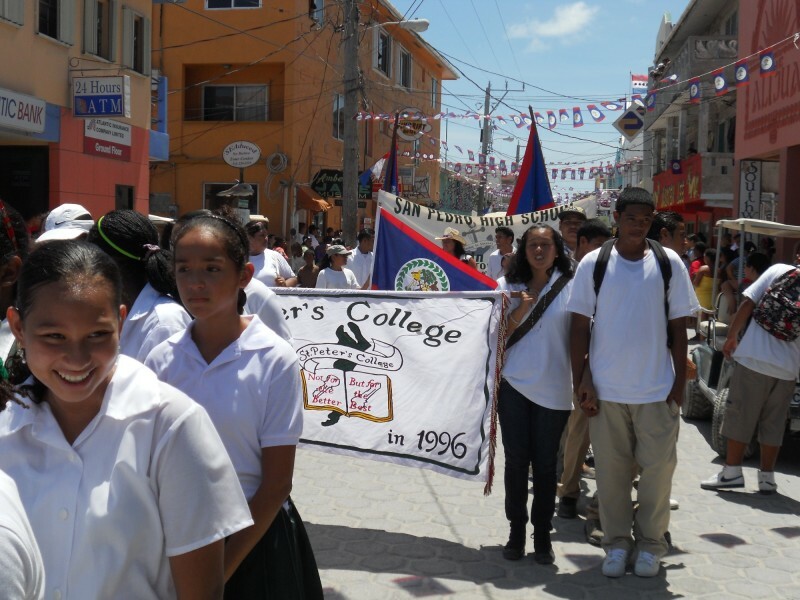 The strands of small, colorful Belizean flags, criss-cross the street, in constant motion. Â This created an appealing fluttering effect along Barrier Reef Drive. Â And a surprising number of San Pedranos have decked out their homes with multiple Belizean flags and other symbols of independence. It's well known that the earliest British settlers in Belize were adventurers, many of whom first arrived as pirates. But, by 1670 the Treaty of Madrid had been reached. Â This treaty encouraged the settlers to put aside their less savory activities and focus on cutting logwood for export back to Europe. These buccaneers/adventurers were known as the Baymen. For the next 100 years the economy of the British settlement in Belize depended upon the logwood the Baymen cut and exported. During the 18th century the Spanish resisted the attempts of the British Baymen to settle and cut logwood in Belize. Time and again The Spanish drove the Baymen from their Belizean settlements. But, the determined Baymen always returned. Â Each time they expanded their settlements and logwood trade. Eventually mahogany replaced logwood as the wood of choice for export by the Baymen. Â And numerous treaties were reached between the British and the Spanish regarding the rights of the Baymen to log in Belize. Most of the early Baymen settlers lived on St. George's Caye. On September 10th, 1793, the Spanish attacked the Baymen's settlement at St. George's Caye for the last time. Although the Spanish forces were powerful, the Baymen effectively used their better knowledge of the coastal waters in this battle against the Spanish. Using an armed sloop, the Baymen joined together with their African slaves and three companies of a West Indian Regiment to fight the Battle of St. George's Caye. Against great odds, they decisively drove the Spanish from Belize. Grand Baymen Belize was chosen as the name for our development, in tribute to the Baymen of Belize. We recognize and appreciate the determination and the independent nature of these early British settlers. They left Europe behind to come to a strange new land. Â They chose to build an alternate, adventurous life, and to start families in the country now known as Belize. The Baymen persistently fought for their livelihood, lifestyle and personal freedom until, ultimately, they prevailed against the Spanish in 1793. Life has changed significantly in Belize since 1793. Â But we find that our Grand Baymen owners are, in some ways, similar to the Baymen of Belize. They are independent thinkers ready to try a different lifestyle in a foreign country. And Grand Baymen is a community that welcomes adventurous, Â independent-minded people. If this sounds appealing, click here to learn more about Grand Baymen's Chill Weekends.